Start off by pounding your chicken breasts and seasoning with salt and black pepper. I place a piece of saran wrap over the chicken breast before pounding to avoid any of the chicken moisture from splashing around. Pounding the chicken breasts tenderizes them and allows for you to flatten them to the same thickness so they cook evenly and in a shorter time. Layer each chicken breast with two to three slices of prosciutto. Top off with three sage leaves. 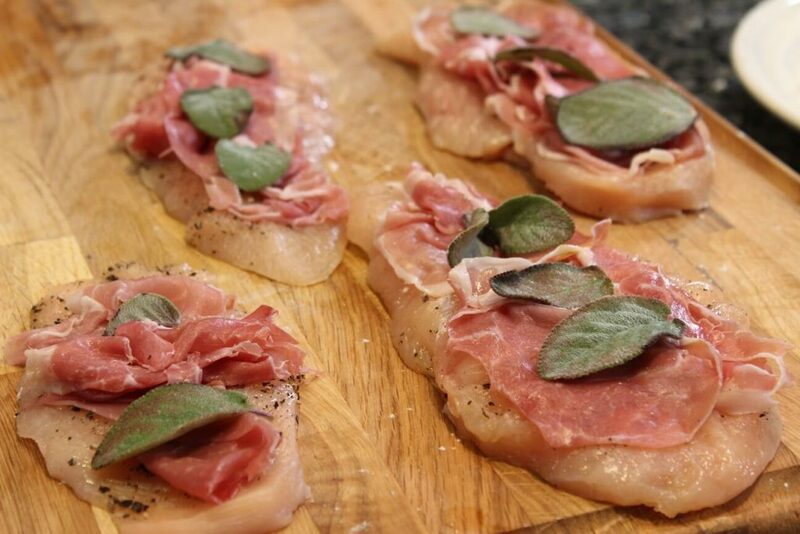 Use a toothpick to sew in each sage leaf and to hold in the prosciutto so that they don’t fall off when cooking. Once you are done adding the toothpicks, coat each side of the chicken breasts with flour. The easiest way is to pour enough flour onto a flat dish to cover the dish and then gently pat each side of the chicken breast onto the flour. Drizzle about four tablespoons of olive oil into a wide, oven safe frying pan. Add in the garlic cloves and fry for about a minute. Begin to add in the chicken breasts, starting with sage side down. Raise the heat to a medium flame and add in four tablespoons of butter. Cook for about 3 minutes or until the sage side is golden in color. Flip onto the other side and add the wine. 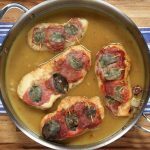 Cook for about two minutes to allow the alcohol to evaporate and to allow the wine flavor to infuse into the chicken saltimbocca. Pour in the chicken stock and bring to a boil over a medium/low flame. Once boiling, place the pan into the oven and cook for about eight to ten minutes. Remove from the oven. Serve with a salad or our preferred side dish. Make sure to remove the toothpicks! 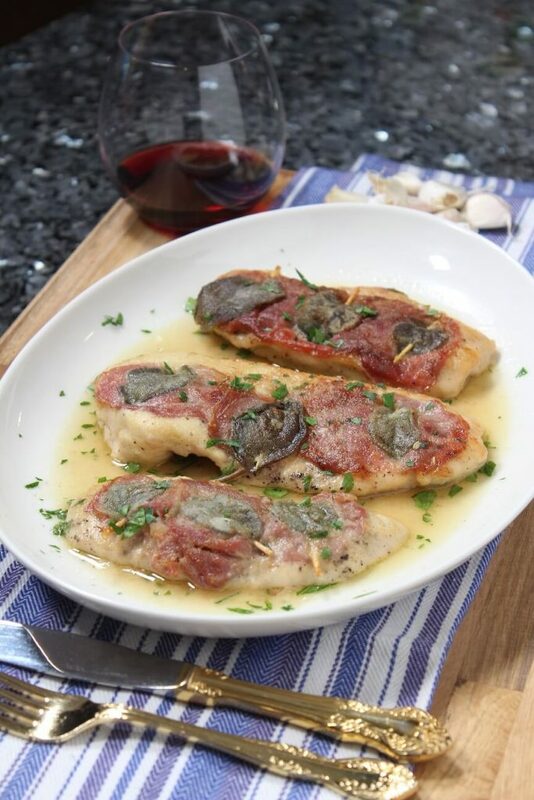 Pour some of the saltimbocca gravy over the chicken and enjoy. Salute and cin cin! 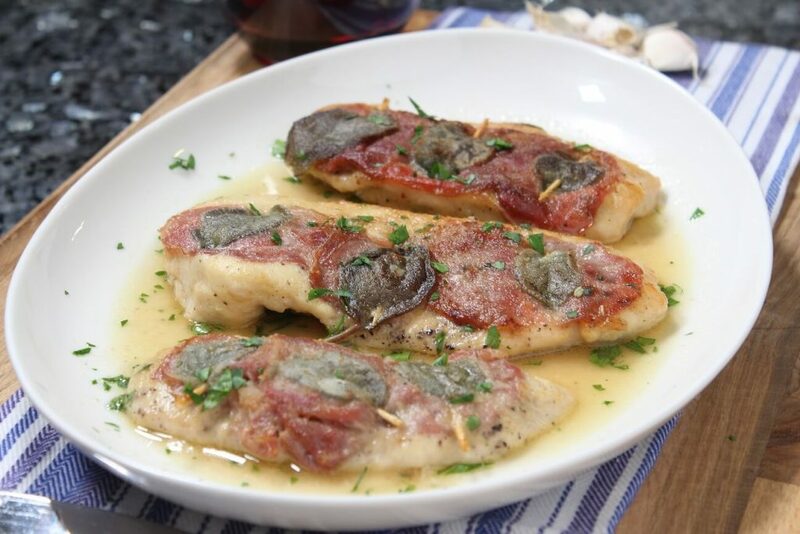 Today I want to share with you my tasty Chicken Saltimbocca recipe! 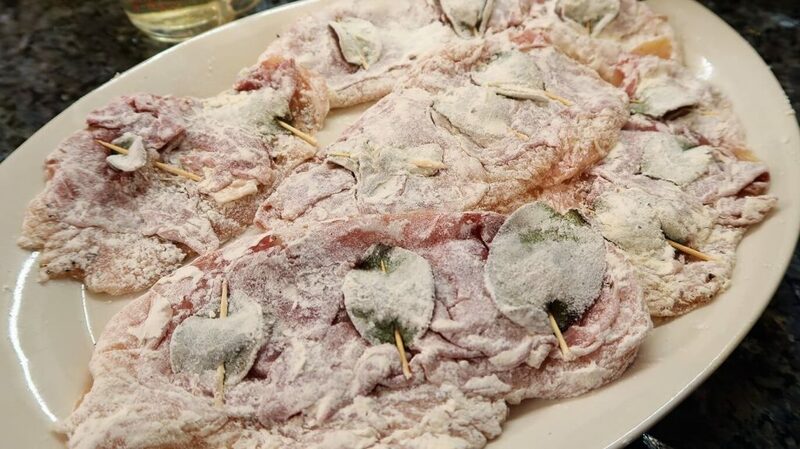 Saltimbocca means to jump into the mouth. 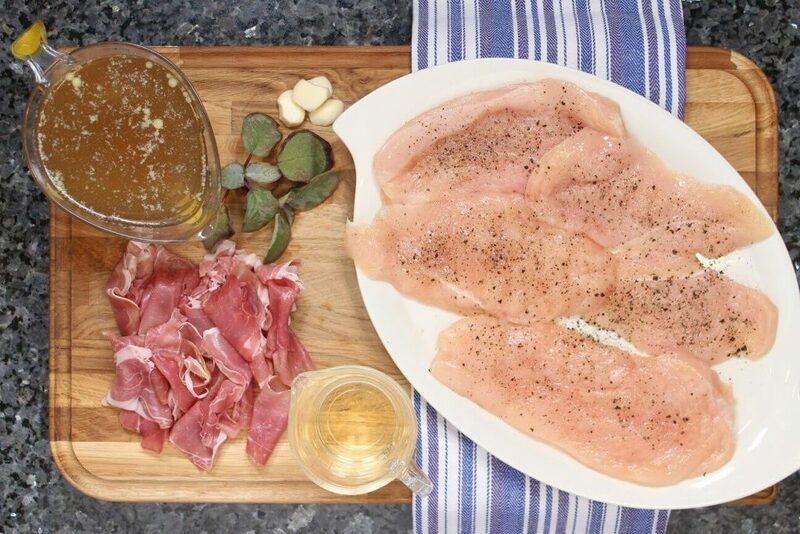 Tender chicken breast, salty prosciutto and flavorful sage make a mouth watering combination that will literally have you screaming saltimbocca! Remove from the oven. Serve with a salad or our preferred side dish. Make sure to remove the toothpicks! 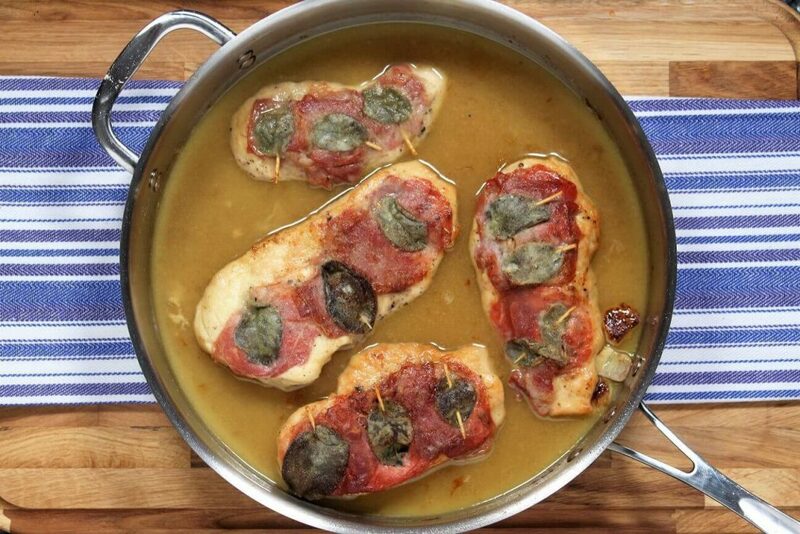 Pour some of the saltimbocca gravy over the chicken and enjoy. Salute and cin cin!